President Trump says if he doesn't get a border wall, he will declare a national emergency to build it. 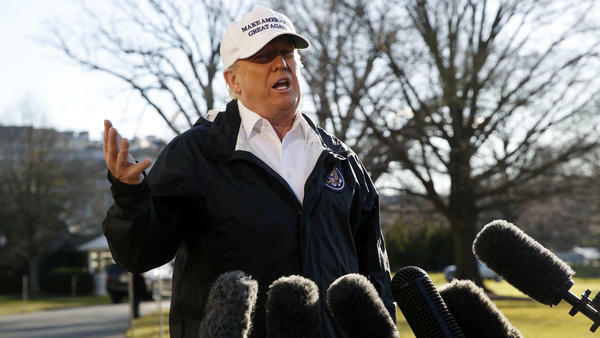 As he left the White House on Thursday morning, Trump said he has the "absolute right" to declare a national emergency in order to construct a border wall but said he prefers to continue efforts to make a deal with Congress. However, he said, "If we don't make a deal, I think it would be very surprising to me" to not declare an emergency. Such a declaration would almost certainly be fought in court. House Speaker Nancy Pelosi, D-Calif., sidestepped a question about the issue Thursday, telling reporters, "If and when the president does that, you'll find out how we will react." She predicted that if the president did take that step, he would have to answer to his own party for "usurping" power. On Thursday, Trump again said Republicans are unified in support of him on the wall, saying he hasn't "ever seen unity like this in the Republican Party." However, several Republican senators have expressed concern over the effects of the continued partial government shutdown, now in its 20th day, and a handful of Republicans voted with Democrats in efforts to reopen the government in the House. Trump also disputed characterizations of Wednesday's meeting with Democratic leaders, from which Trump abruptly walked out. On Thursday morning, he told reporters that "I didn't pound the table. I didn't raise my voice, that is a lie," adding, "I don't have temper tantrums. I really don't." In her news conference, Pelosi suggested that Wednesday's White House meeting with Hill leaders was never about a serious negotiation. "I think the meeting was a setup so he could walk out," she said. Recounting an exchange during the meeting, she said, "I said to him: You are moving the goal posts so many times they are out of the stadium." She said the president keeps changing his demands: "I don't even know if the president wants the wall." Democratic congressional leaders have refused to go along with Trump's demand for border wall funding, and Senate Majority Leader Mitch McConnell has refused to take up Democratic measures to fund government agencies that have run out of appropriations. Some 800,000 federal workers have been furloughed or are working without paychecks because of the standoff. Many will be missing their first paychecks on Friday. The FBI Agents Association, whose members are among those working without pay, sent a petition to the White House and congressional leaders warning of the effects of the shutdown on agents and their work. It says that FBI agents could face difficulty in obtaining or renewing security clearances if they miss bill payments and that "pay uncertainty undermines the FBI's ability to recruit and retain high-caliber professionals." Trump also said that despite his repeated campaign promises to build a wall and have Mexico pay for it, he didn't mean that literally. "When I said Mexico would pay for a wall in front of thousands and thousands of people," Trump said, "obviously I never meant Mexico would write a check." But a March 2016 memo from the Trump campaign to the The Washington Post said, "It's an easy decision for Mexico. Make a one-time payment of $5-10 billion to ensure that $24 billion continues to flow into their country year after year." Trump also announced on Twitter that he has canceled a planned trip to Davos, Switzerland, later this month for the World Economic Forum, blaming Democrats' "intransigence" on border security. It's unclear what could break the impasse, as the White House has not outlined any Democratic priorities it is willing to offer in exchange for wall funding. Vice President Pence told reporters Thursday that the president was not interested in offering concessions on DACA, Deferred Action for Childhood Arrivals, which allows some people in the U.S. illegally who were brought here as children to be shielded from deportation. Legal challenges to the Obama-era program are playing out in the courts, and Pence said the president prefers to let the Supreme Court weigh in on the matter first. Pence also defended the president's right to use emergency powers to sidestep Congress to build a wall without lawmakers' consent. Trump believes he "has an absolute right" to declare a national emergency, although he offered no timeline for when the president might consider invoking those powers. The vice president also said the administration would not agree to sign any of the seven outstanding funding bills to reopen government, even though six of the seven bills have nothing to do with the border fight and have left hundreds of thousands of federal workers furloughed or working without pay. "Nothing is going to move until we reach an agreement," he said, adding that there could be no agreement without a border wall. "No wall, no deal." Other attempts to forge a solution have also failed. A small group of Senate Republicans, led by Sens. Lindsey Graham, R-S.C., and Lamar Alexander, R-Tenn., launched their own talks to end the shutdown on Wednesday after the failed White House meeting. They huddled with moderate Sens. Lisa Murkowski, R-Alaska, and Susan Collins, R-Maine, to vet their options before talking to McConnell and Pence on Thursday. But by the end of the day, Graham was already declaring defeat. "We're stuck," Graham said. "I don't know what else to do." In a statement Thursday evening, Graham urged Trump to invoke emergency powers, adding: "I hope it works." 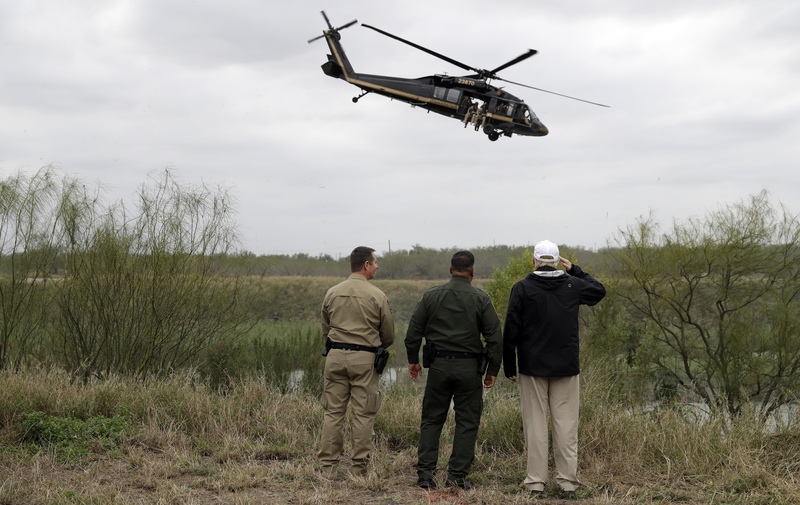 President Trump salutes a U.S. Customs and Border Protection helicopter as he tours the U.S. border with Mexico at the Rio Grande on Thursday in McAllen, Texas. Collins said the talks ran into difficulties when it became clear that Trump and Pelosi are still "dug in." "It is very difficult when we are dealing with people who do not want to budge at all in their positions," Collins said. "And that's the president and Speaker Pelosi." At the roundtable discussion in McAllen, Trump heard from relatives of law enforcement officers who were killed by immigrants who were in the country illegally. With weapons, cash and drugs seized at the border on display in front of him, Trump said news reports, which have called the situation at the border a manufactured crisis, are wrong. "What's manufactured," he said, "is the word 'manufactured.' "
He said Democrats were in "an indefensible position" and are all "looking at 2020." Trump also addressed other criticism. "They say a wall is medieval. Well, so is a wheel," he stated. "A wheel is older than a wall." Fact check: False. The wall predates the wheel by some 4,500 years.